According to a medieval legend, St Ursula and her 11,000 companions returned to Cologne from their pilgrimage to Rome just at the time when unbeknown to them, the Huns were besieging the city. As soon as they disembarked, the Huns leapt upon them with savage cries and the massacre began. In the picture, the leader of the Huns on the right is willing to stop the massacre if Ursula would consent to marry him, but she refuses and is martyred together with her companions, while the angels carry their souls to heaven. The Huns are depicted here in fanciful Turkish costume, as when this picture was painted, the Ottoman Turks were perceived to be the modern equivalent of Huns, the major enemy of Christendom. A thousand years before, Attila and his Huns had invaded Europe and ruled a large area of central Europe and Italy from 434, including Rome, until his death in 453. St. Ursula is shown here holding her bridegroom who is pierced by a sword, centre. The leader of the Huns, with followers, stands in front of tent at right. Angels carry the souls of the Virgins to heaven. 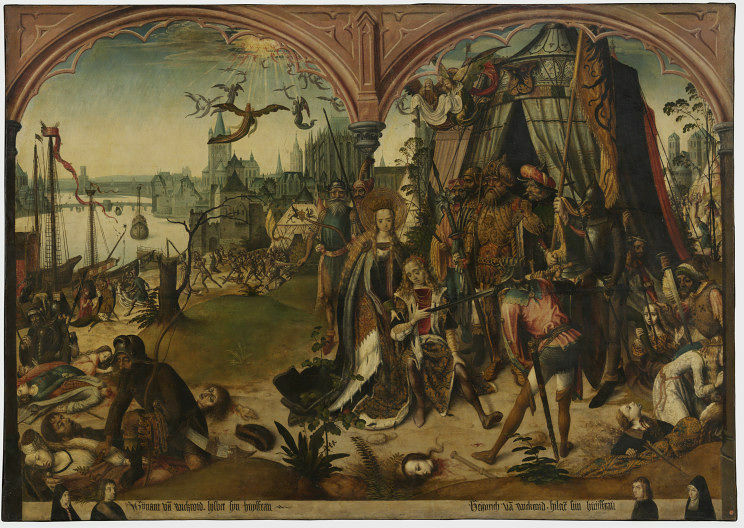 The massacre of Virgins is depicted at left, right and background. Topographical view of Cologne behind, with Rhine at left, with large church of St. Martin on the bank, the tower of the city hall adjoins the great cathedral and the church of St. Gereon appears at the right of the tent. The top is painted with two arches, and below are represented two pairs of donors, with identifying inscriptions. Provenance: Possibly from the Church of St Bridget's, Cologne (contents auctioned in 1805); bought by the Museum from an unknown source in 1857 `as an illustration of costume and ornament' for £31.10s. Below, two pairs of donors are identified by inscription as Wynant van Wickroid, his wife Lysbet, and Heinrich van Wickroid with his wife Hilgen. It has been possible to identify the donors with actual citizens of Cologne recorded in the city archives. It was they who paid for these pictures to be hung in a church, probably St. Bridget's . 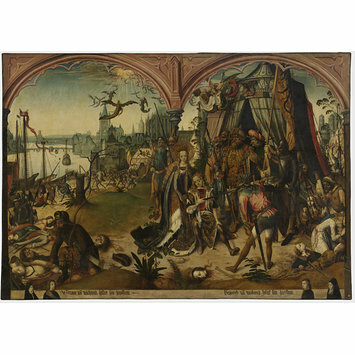 The donors of this painting, Wynant and Heinrich van Wickroid, were brothers: Wynant was a tax collector, Heinrich a silk weaver, city councillor and magistrate in the 1480s and 90s. His wife, Hilgen, was also an independent silk weaver; she married in 1492/3 and died some four years later. They belonged to the class of wealthy manufacturers and tradesmen that provided much of the artistic patronage, not only in Cologne, but also in the other commercial centres of 15th century Germany. Ursula was the daughter of a British king called Notus or Maurus. She came to the attention of the pagan King of Anglia who wished to marry her to his son. Ursual agreed with the proviso that she could have three years to to fulfill her dedication to virginity and that the king's son should eb beaptised and receive instruction in the faith.A further condition was that she could set sail with ten virgin companions, each of who would have a thousand further virgin attendants. Winds blew them into the mouth of the Rhine; they sailed to Cologne and Basle, went on pilgrimage to Rome and returned to Cologne. There they were martyred by Huns for their Christianity, Ursula having refused to marry their chief, In the picture, the leader of the Huns on the right is willing to stop the massacre if Ursula would consent to marry him, but she refuses and is martyred together with her companions, while the angels carry their souls to heaven. The Huns are depicted here in fanciful Turkish costume, as when this picture was painted, the Ottoman Turks were perceived to be the modern equivalent of Huns, the major enemy of Christendom. A thousand years before, Attila and his Huns had invaded Europe and ruled a large area of central Europe and Italy from 434, including Rome, until his death in 453. In 1155 a vast collection of bones was discovered in Cologne which were considered to be those of the martyrs and these were used to feed a market for relics. Further support for the cult was provided by Elizabeth of Schönau favoured, from 1152, with ecstasies and visions of various kinds, these she related to her brother who recorded them in three books including 'The revelation on the Martyrdom of St. Ursula and her companions' full of fantastic exaggerations and anachronisms. 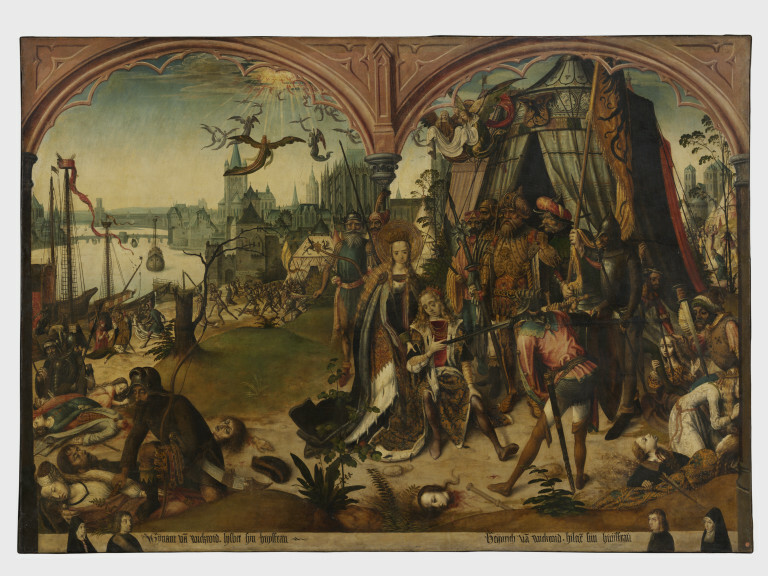 Ursula's late medieval iconography is exremely rich: about twenty five cycles of her life survive, painted from the 14th to the 16th century several of these are in Cologne. Oil painting depicting the matryrdom of St.Ursula and the 11,000 virgins, the Master of the St.Ursula Legend, ca.1492. C. M. Kauffmann The Legend of St Ursula, V&A Museum Monograph, 1964. Frank Günter Zehnder, Katalog der altkölner Malerei, Kataloge des Wallraf-Richartz-Museums XI, Köln, 1990, pp. 382-91. Kauffmann, C.M., Catalogue of Foreign Paintings, I. Before 1800. London: Victoria and Albert Museum, 1973, p. 184-6, cat. no. 222.